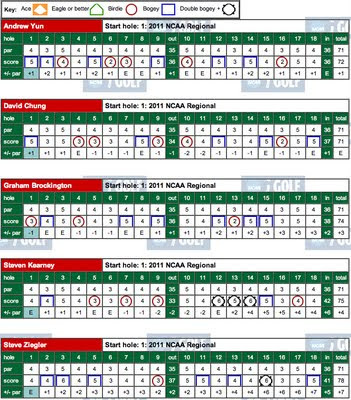 FINAL RESULTS - Stanford just missed advancing to the NCAA Finals, finishing 6th, 4 shots out of the 5th spot needed to continue its season. 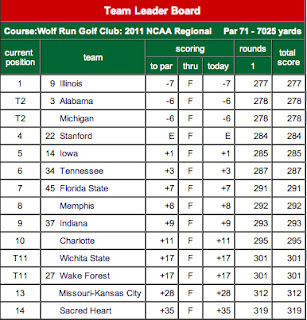 It was a disappointing final event for the Cardinal team which found itself 28 shots behind the surging Michigan team that won the regional. Junior David Chung led the way tying for 11th at an even par 213 total. 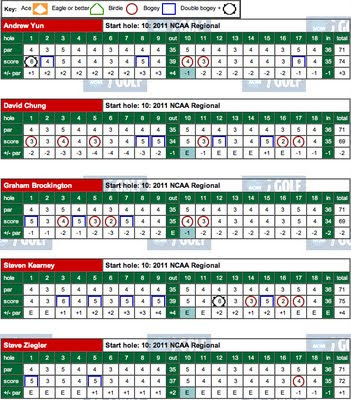 Despite the disappointing final result, hats off to Andrew Yun for his outstanding season which surely will earn him All-American honors, to the steadily improving play of senior Graham Brockington and sophomore Steven Kearney and to the excellent leadership of captain Steve Ziegler. Freshman Cameron Wilson had a very strong first season and shows great promise while junior David Chung provided excellent contributions and special drama for Cardinal fans with his Masters appearance. Senior Sihwan Kim's brilliant Stanford career was cut short due to a lingering back injury while Shane Lebow and Wilson Bowen showed encouraging signs of strong play this season. Andre De Decker, although not playing in a tournament this year, showed flashes of solid play in practice and can be a contributor next season. In other regionals five Pac 10 teams advanced to the NCAA finals. 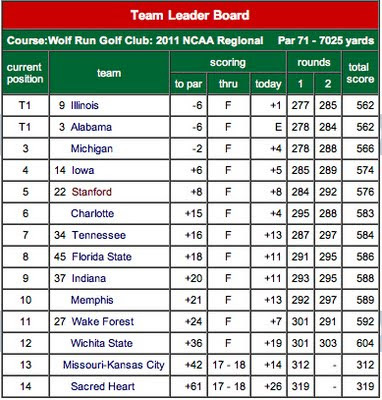 ROUND 1 RESULTS - Stanford ended in 4th place after the first round at the NCAA Indiana Regional played at Wolf Run Golf Club. 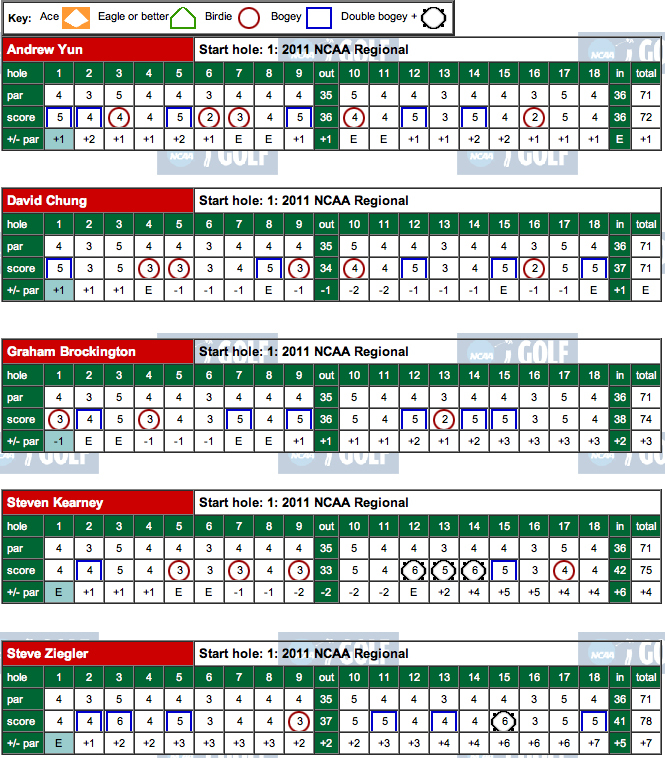 Complete results can be found below showing all team scores, Stanford's player scoring and overall finish plus individual scorecards for each player. Five teams advance to the NCAA Finals to be held at the home course of top ranked Oklahoma State in Stillwater, Oklahoma May 31-June 5. 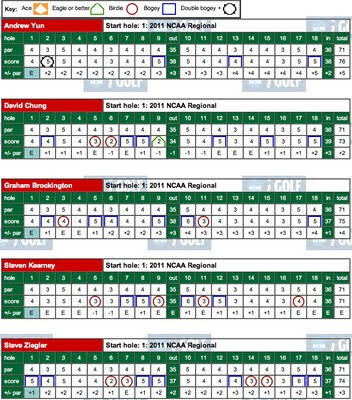 Competing for Stanford in the NCAA Midwest Region at the Wolf Run Golf Club in Zionsville, Indiana are Andrew Yun, David Chung, Steve Ziegler, Graham Brockington and Steven Kearney. Live scoring can be found at Golfstat.com. The low five teams out of the 13 competing teams advance. 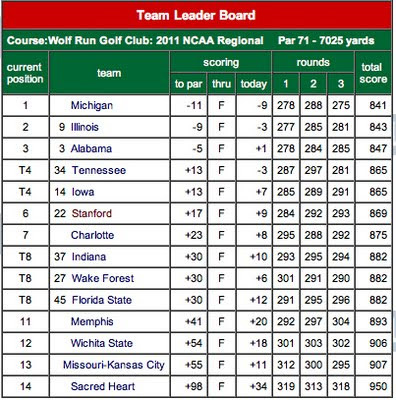 With national Golf Week rankings in parentheses, Stanford (21) is seeded #4 in this region behind Alabama (3), Illinois (11) and Iowa (18), followed by Tennessee (23), Wake Forest (26), Indiana (37), Florida State (41), Michigan (53), Memphis (63), Wichita St. (112), Missouri (120) and Sacred Heart (212). The pre-event story below was posted on our gostanford.com website about Stanford earning the 4th seed in the Indiana Region --- http://www.gostanford.com/sports/m-golf/spec-rel/050911aab.html. The official NCAA website --- http://www.ncaa.com/news/golf-men/2011-05-09/regional-participants-announced --- shows all the seeded teams and their assigned locations. Here is the Indiana Regional information. Eight Pac 10 teams earned bids with UCLA a #1 seed, USC a #3 seed, Stanford, Cal, ASU and Oregon #4 seeds, Washington a #6 seed and Arizona a #11 seed. Five teams in each of the six regions will advance to the finals to be held at the home course of top ranked Oklahoma State in Stillwater, Oklahoma May 31-June 5. STANFORD, Calif. - The NCAA Division I Men's Golf Committee has selected the teams and individuals to participate in the 2011 NCAA Division I Men's Golf Championships and Stanford has earned the fourth seed in the Indiana Region, to be held May 19-21 at the Wolf Run Golf Club in Zionsville, Ind. It marks the second straight year the Cardinal has began its quest for a ninth national championship in the state of Indiana. 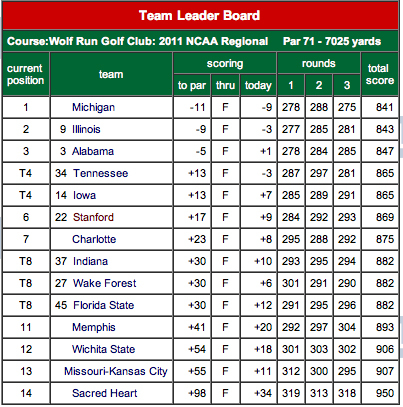 Last season, Stanford captured the Central Regional held at the Warren Course in South Bend. Joining Stanford in the Indiana Region (in order of seeding) are Alabama, Illinois, Iowa, Wake Forest, Tennessee, Indiana, Florida State, Michigan, Charlotte, Memphis, Wichita State, Missouri-Kansas City and Sacred Heart. The low five teams and the low individual not on those teams from each regional will advance to the finals to be held at Karsten Creek in Stillwater, Okla., May 31-June 5. Stanford, coming off a fourth place finish at the Pac-10 Men's Championships, has won eight national titles, with the last title coming in 2007. Wolf Run Golf Club --- http://wolfrungc.com/ --- was conceived in the early 1980's by the late Dr. Jack Leer, a local dentist and successful amateur golfer whose dream was to build a demanding, world-class golf club for serious golfers. Dr. Leer wanted to craft a course employing the strength and beauty of the natural landscape while emulating the unique theories of 1920's design. To create his vision, Leer turned to Steve Smyers, an accomplished player and well-traveled student of the legendary architects and the golf courses that they created. The course construction began in 1987 at the heavily wooded 218-acre site featuring meadowlands, a large bluff cutting across the entire tract, and Eagle Creek winding through the property. "We didn't move a lot of earth but built the course using the existing landscape," said Smyers. Dr. Leer desired his course to be so challenging and dramatic that it would attract a membership of top players from around the country. Soon after its opening in 1989, Wolf Run received high praise from some of golf's greatest players and the course acquired a reputation for being too tough for the average golfer. After touring the course for the first time, Gary Player said, "Wolf Run is the best new course I've seen in twenty years." Nick Faldo played the course and told Smyers that Wolf Run had more variety than any course he'd ever seen. Faldo stated holes twelve through fifteen were "the most demanding yet fairest of any golf course I've ever seen." By years end, Wolf Run acquired a course rating of 74.3 and a slope of 151 from the back tees, which resulted in being considered among the toughest courses in the country. The golf course is as diverse as its scenery, yet tests every facet of the player's ability. With narrow fairways and firm, fast greens surrounded by dramatic and strategic bunkering, players quickly realize that all the shots are required to play Wolf Run. Wolf Run's par three holes require intense strategy and range from a short, downhill shot of 132 yards to a small green that boarders Eagle Creek to another that requires the player to carry his tee shot more than 230 yards from a severe drop off to a green heavily surrounded by deep bunkers. Many of the par four holes demand long drives and carefully carved approaches to small targets, while others require precision in order for the player to find the best angle to attack the pin. Holes three, ten, and seventeen make up the par fives and are as beautiful, yet as challenging as any in America. As a result, Wolf Run is a thinking man's course, where a player at the top of his game would be offered strategic and at times heroic options on every hole. Through the years, the course has been modified to take out some of the bite that the original design presented. 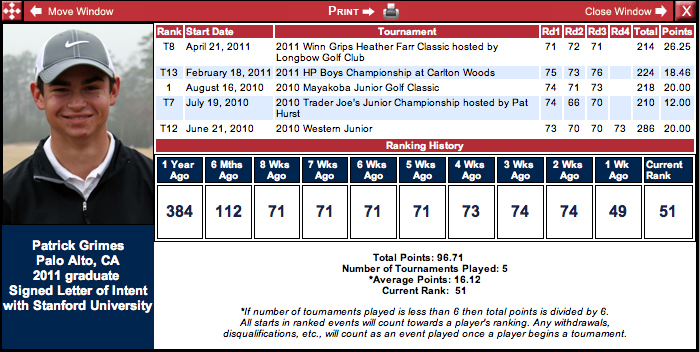 However, the course is still quite demanding with a current course rating of 74.2 and a slope of 143. In 2003, Smyers renovated the course, which entailed the lengthening of several tees, the addition of several new bunkers to recreate the original design of certain holes, and finally the redesign of the 13th green. 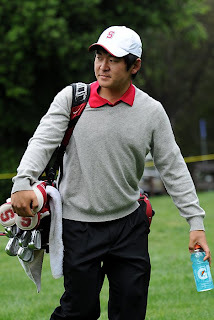 The following article appeared on the gostanford.com website - http://www.gostanford.com/sports/m-golf/spec-rel/050911aaa.html honoring Andrew Yun as an All-Pac 10 first team performer for his great 2010-11 season. 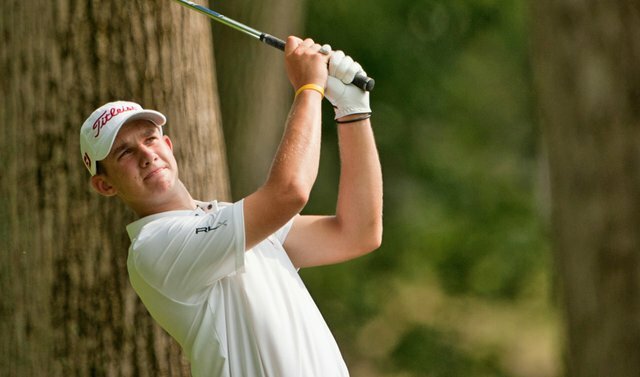 Andrew is currently ranked #2 by Golf Week/Sagarin --- http://www.golfweekrankings.com/ellington/default.asp?t=mi --- among all collegiate golfers behind only Peter Uihlein of Oklahoma State, and ahead of the Pac 10 player of the year, Patrick Cantlay of UCLA. Andrew has a stroke average of 70.6, about 3 strokes lower than any other Stanford player this season, and he has one win and 7 top 10 finishes with a low round of 64. He finished 4th in the recent Pac 10 championship held at Stanford. 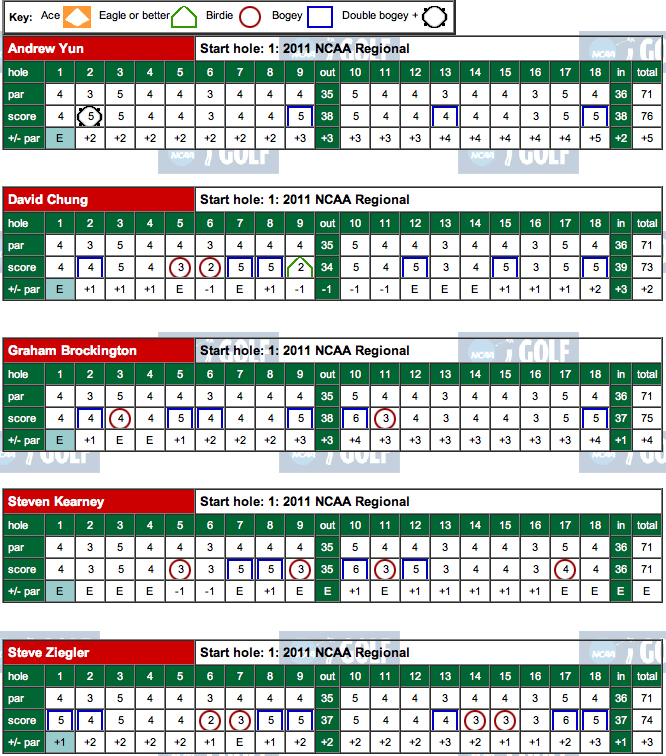 See Andrew's summary results --- http://stanfordmensgolf.com/players.htm --- this year along with the rest of Stanford's players. 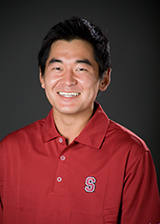 STANFORD, Calif. - Stanford's Andrew Yun was named to the 2011 All-Pac-10 Men's Golf Team on Monday, as selected in a vote of the conference coaches. Yun, who has seven Top 5 finishes amonmg his 10 starts this season, including his first intercollegiate title, was Stanford's lone representative on the all-conference team. Patrick Cantlay of UCLA was named the Pac-10 Men's Golfer of the Year and Pac-10 Freshman of the Year, while UCLA's Derek Freeman was tabbed Pac-10 Coach of the Year. Other first team honorees included Gregor Main of UCLA, Daniel Miernicki of Oregon, Alex Moore of Oregon State, Scott Pinckney of Arizona State, Martin Trainer of USC, Pontus Widegren of UCLA and Chris Williams of Washington. Heading up the second team were Stephen Hale, Max Homa and Eric Mina of Cal, Charlie Hughes of Washington, Jeffrey Kang and Steve Lim of USC, Tarquin MacManus of Arizona and Andrew Vijarro of Oregon. Ben An (Cal), Philip Francis (Arizona state) and T.J. Vogel (USC) landed honorable mention honors. 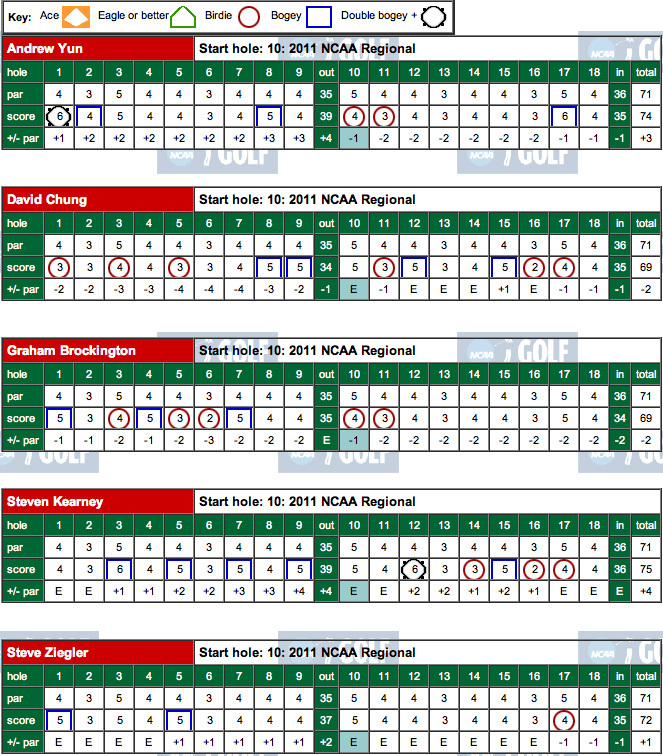 Here's a review of Stanford's three incoming freshman for the 2011-12 season. The three are Patrick Rodgers of Indiana, Patrick Grimes of Northern California and Marcel Puyat of Southern California (by way of the Philipines). In recent months, Patrick Rodgers, in particular, has been invited to participate in some high level amateur events and his results have been very strong up against excellent amateur and collegiate competition. Patrick finished 2nd, 1 shot behind the winner, at 11-under par in the Terra Cotta Invitational in Naples, Florida with rounds of 67-70-67 while Marcel finished tied for 11th with rounds of 70-73-71. In the Azalea Invitational in Georgia, March 24-27, Patrick finished third with rounds of 68-69-67-67--271 against another strong field. In the Jones Cup Invitational, February 4-6, Patrick finished tied for 3rd, one shot behind the leaders, on rounds of 73-71-74 beating notables such as Scott Langley, Patrick Reed, Bobby Wyatt and Peter Uihlein among others. 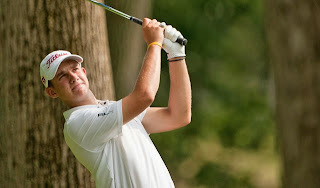 Patrick Rodgers is rising on the World Amateur Rankings, which weights results over the previous 12 months, as he is now ranked 63rd in the world --- ahead of him are current Stanford stars David Chung at #2, Andrew Yun at #13 and Sihwan Kim at #53. Andrew Yun embraced golf as a 7-year-old in Tacoma, Wash. He had played tennis previously, but he joined his dad on the links one day and soon came to savor the game's unique nature - facing the course more than an opponent. At 14, already an accomplished junior player, Yun was emboldened enough to pose a weighty question to his parents: Want to move to Arizona? It became a pivotal moment in Yun's winding path to Stanford, where he blossomed into the Cardinal's top player this season. Yun, a sophomore, is ranked No. 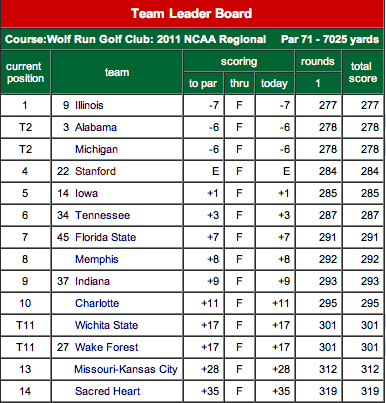 2 in the nation by Golfweek entering the Pac-10 championships, which begin today at Stanford. The idea of moving to a warmer, practice-friendly climate is hardly revolutionary. Some of Yun's friends from junior tournaments made similar moves. Paula Creamer and her parents relocated from Pleasanton to Florida when she was 14, so she could attend a golf academy. Still, year-round sunshine hardly guarantees Creamer-like success. And Yun's family had firm roots in the Pacific Northwest: His parents, Paul and Gloria, lived in Tacoma for 25 years after coming to the United States from Korea. They owned several convenience stores and gas stations in Washington. They sold all but two of them and headed to suburban Phoenix, even if they knew few people there. (They now manage a hotel in Mesa, Ariz.) It helped that Yun's two older sisters already were in college at the time. "It was something I suggested, and it obviously was a very tough decision for my parents," Yun said this week. "They sacrificed so much for me. They felt like I knew what I was talking about, even though I was 14. They knew it would help my game a lot in the long run." Yun struggled in the short run. He had trouble adjusting to swing changes pushed by a new coach (whom he later dropped) and tumbled from No. 3 in national junior rankings to No. 150. He felt extra pressure his first year in Arizona, partly because his parents uprooted their lives to accommodate his ambitions - and he was going in the wrong direction. "That really humbled me," Yun said of his plunge in the rankings. He eventually righted himself after reconnecting for long-distance lessons with Joe Thiel, his former coach in Tacoma. Yun had the best of both worlds, with warm winters for extended practice and a coach with whom he was comfortable. Yun doesn't hit the ball especially far - his average drive travels 275-280 yards, by his estimate (Editor's note ---- watching Andrew in the Pac 10 showed he can hit it 300+ yards when he wants to) - but he leans on accuracy and a sharp short game. He has posted Stanford's low score in six of seven events this season, with five top-5 finishes. (he added another top 5 finish in the Pac 10 tourney finishing 4th). Now comes a conference tournament with a history of producing individual winners who later thrive as pros, from Scott Simpson (1975-76) and Corey Pavin ('82) to Phil Mickelson ('90) and Tiger Woods ('96). Yun is a long way from matching those players, but he's already come a long way.